I feel very lucky to have had access to weekly spring goodies at the Union Square Farmers Market. We have some amazing fruit shops around Astoria — United Brothers on 30th Avenue being number one in my book — but I’ll never tire of picking out ramps caked with dirt, scouring through scallions to find the garlic scapes that get left behind when someone buys the whole bucketful while I’m out seeing if anyone else has a better deal. And let’s not forget the joy of finding all the glorious pink and red: the rhubarb, the strawberries of spring. But it’s those ramps and garlic scapes, along with spring onions and thin, tender asparagus shoots, that are going in this risotto. Unbeknownst to me at the time of purchase last week, ramps appear to be just about done for the season — guess it really is almost Memorial Day. But that’s okay. Can’t make it to a farmers market or missed out? 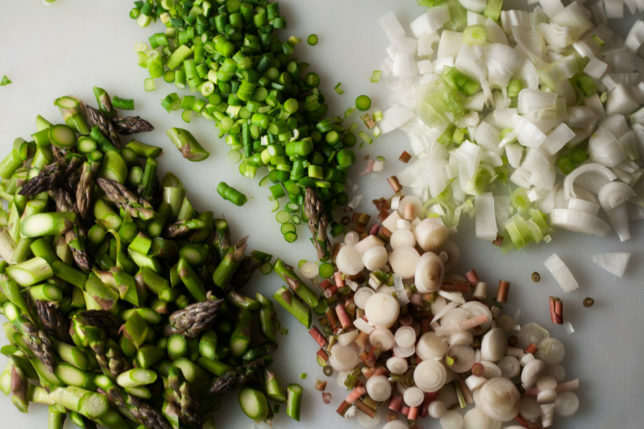 Leeks, scallions, and garlic will do just fine. This recipe is adaptable. Replace the asparagus with spring peas or create with a combination. Leave it out completely. This is all about you and the beautiful bowl of sophistication you’re about to create in your own kitchen. Apologies for the lack of process photos — you do need to be on your toes for a bit, stirring the wine constantly until it’s absorbed and evaporated, and I’d rather have a good dish than one that I kept removing from the heat to take photos. Have everything ready — mise en place — so that you don’t have to go scurrying around at the last minute. Except the cheese. The parmigiano-reggiano you can grate later, because there’s magic in the second half of this recipe: instead of adding stock one ladleful at a time, you add almost all of it at once, give it a stir, cover, and stir it just twice within about an 18-minute period, give or take. A final pour of stock at the end of that period is what intensifies the creaminess, along with a last dab of butter, and your freshly grated cheese. The dish is finished with lemon juice, salt and pepper to taste, additional broth to loosen up the consistency just a wee bit or to your liking, and a sprinkling of bright green shredded ramp leaves. 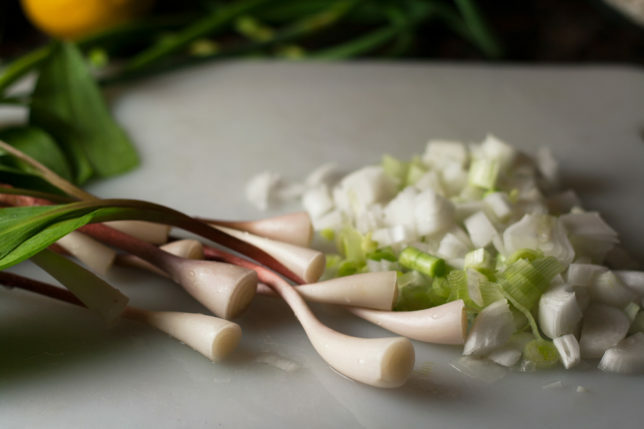 If you can’t find ramps, slice up the dark green of your scallions or even chop up some parsley. It’s really for show at this point, but it does freshen it up and, in this case, adds an extra dose of garlicky-oniony, almost grassy essence, that which is so unique to ramps. I served these bowls with glasses of the Pinot Grigio I used in the cooking. 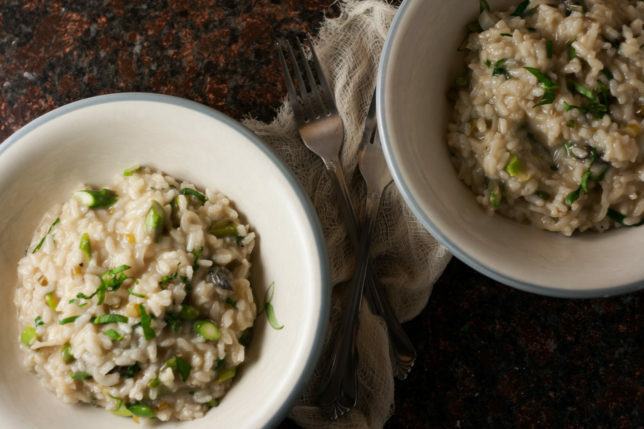 Because making risotto means you’re actually a grown-up, right? Right. Yep, these are weird alliums I have here. Spring onions, ramps, and garlic scapes all have a slightly different flavor than their usual supermarket counterparts, and yes, they are seasonal, but ramps are just wild leeks, so leeks would be a fine replacement, garlic is just a bit stronger, but is essentially the same, and spring onions, with a bulb, are very similar to scallions or green onions. I might reduce the garlic down to 2 cloves since scapes are a bit milder. You can also switch anything out for shallots or just plain onions. 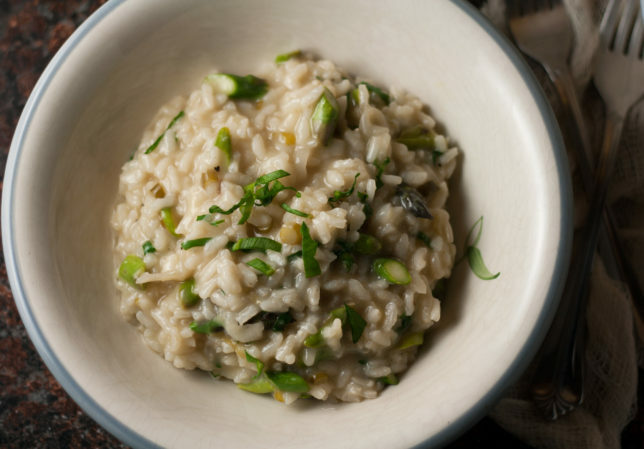 This recipe is easily adaptable, and can be made with whatever ingredients are in season or found in your grocery store. If you’re using ramps, leeks, spring onions, or scallions, make sure you wash them very carefully. 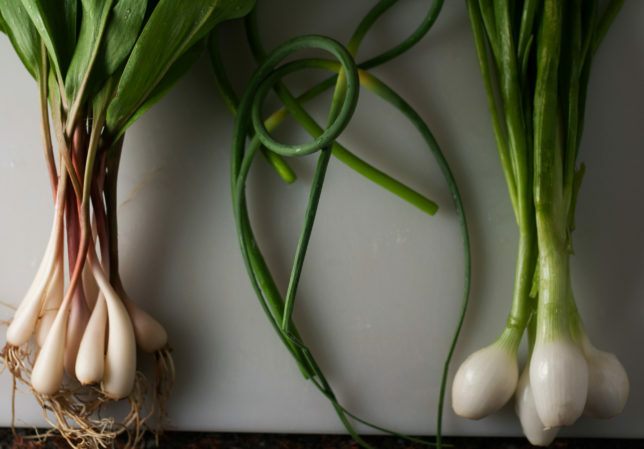 Leeks and ramps especially tend to have a lot of grit within their layers. Bring broth and water to a boil in a large saucepan. Reduce heat to medium-low to maintain a gentle simmer. Melt 1 tablespoon butter in a Dutch oven over medium heat. 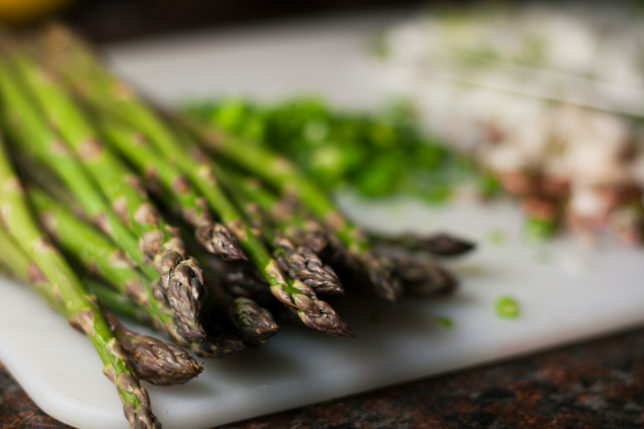 Add asparagus spears, a pinch of salt, and a pinch of pepper, and cook, stirring occasionally, until the asparagus is crisp-tender, about 4 to 6 minutes. Transfer to a plate and set aside. Add 3 more tablespoons of butter to now-empty Dutch oven and melt over medium heat. Add spring onions, then ramps, then garlic scapes, giving each just a moment to soften before adding the next allium. Add about ½ teaspoons salt and stir until softened, about 7 minutes total. Add rice and cook, stirring frequently, until grains are translucent around the edges, about 3 minutes. Pour in wine and cook, stirring constantly, until it’s fully absorbed, about 2 to 3 minutes. Stir in 5 cups of broth or stock mixture. 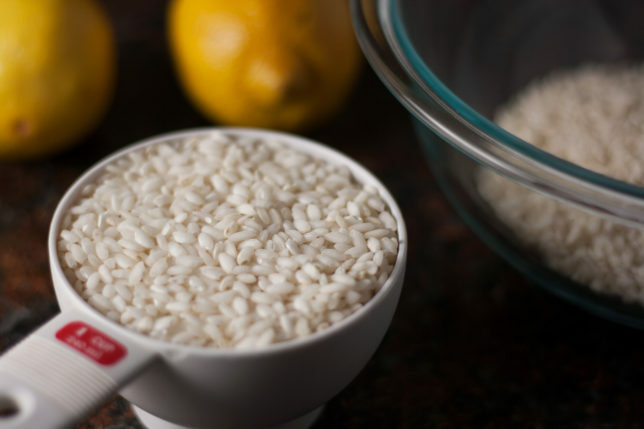 Reduce heat to medium-low, cover, and simmer until almost all the liquid has been absorbed and the rice is just al dente, 16 to 19 minutes, stirring twice during cooking. 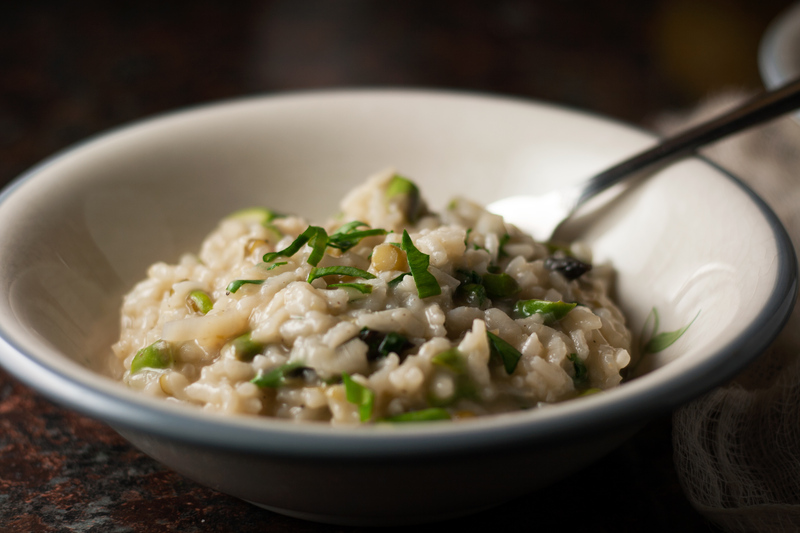 Add ¾ cup hot broth mixture and stir gently and constantly until risotto becomes creamy, about 3 minutes. Stir in Parmigiano-Reggiano. Remove from heat, cover, and let stand for 5 minutes. Stir in the remaining 2 tablespoons butter, shredded ramp leaves, and lemon juice. Fold in reserved asparagus. 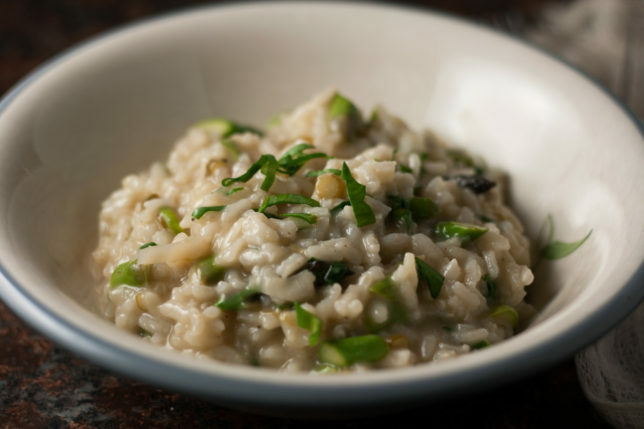 To loosen the texture of risotto, add more broth to taste. Season with salt and pepper to taste and serve immediately, passing more parm as desired.